Providing residents with stimulating activities is an important part of the care given by Auburn Village. Our activities programs are designed for all levels of participatory ability. From lively discussions, card games, trivia and current events, to outings and performances in-house, our activity programs are designed to appeal to each resident’s physical, mental and psychosocial well-being. Activities that include art and or music always resonate deeply with residents. Hearing Frank Sinatra’s Strangers in the Night or the sound of the Glenn Miller Orchestra’s Moonlight Serenade can transport residents to a time of warm memories and youth. They often sing along, tap their toes and smile fondly as they hear these wonderful songs. 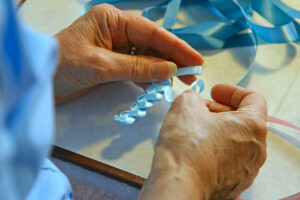 Arts and Crafts activities give residents an opportunity to actively participate and feel a sense of accomplishment which is very beneficial to their state of mind. Painting, sewing, knitting, drawing, making holiday decorations and finger painting offer residents of all cognitive ability the opportunity to participate. Our activity staff work with each resident to identify their natural talent and tailor these activities to the resident’s needs. For Auburn Village, we place high value on incorporating art and music as part of our activity programming. We offer many different activities that showcase the talents of the residents. We also have many performers visit to provide live musical entertainment. These activities are paramount for the spiritual well-being of our residents. We strive to offer the very best experience for residents and their families by creating an environment which is alive with happiness, positivity and good times. Art and music activities are two very good ways in which we make our residents our family.